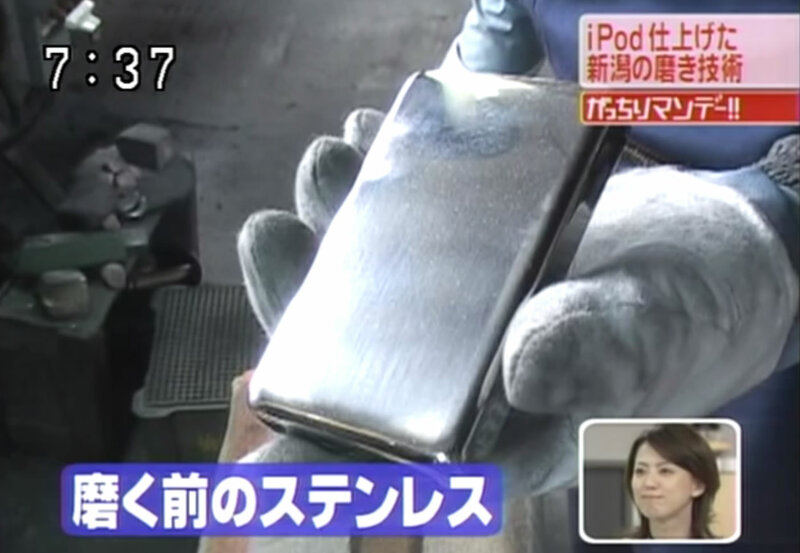 Mirror Polishing skill on iPod stainless case by a legend craftsman in Niigata, Japan. There is a legend craftsman who contributed to Apple’s success in Niigata, Japan. 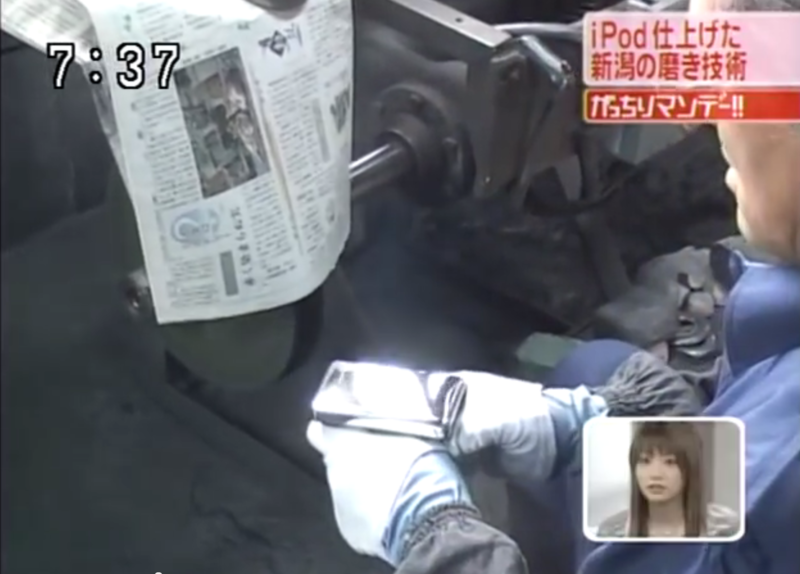 His name is Kobayashi, a well known person in “Metal Polishing” market in Japan. 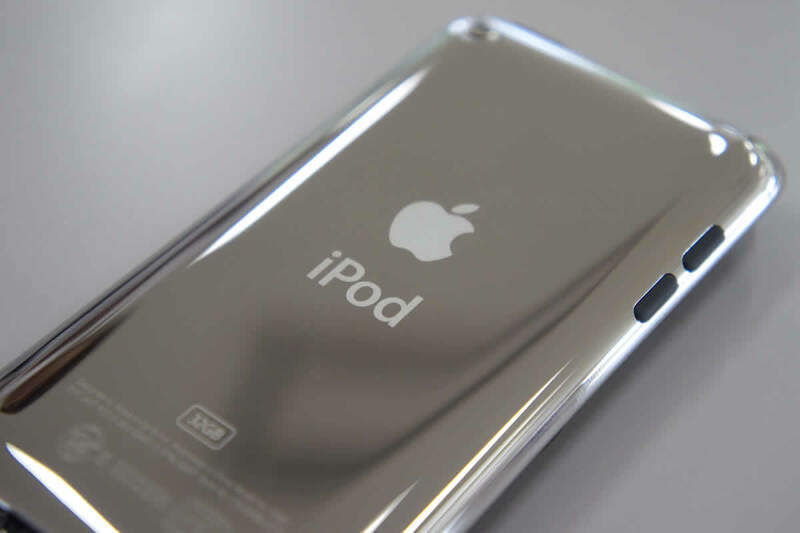 His polishing technique was approved by Apple Inc when “iPod” was released in 2001, and he and his cooperators had polished no less than 15,000 to 20,000 stainless cases in a day when the production line was peak in 2005. Today, his company does not have any jobs from Apple Inc. however, his works was evaluated highly by Apple Inc. and was allowed to announce themselves as Apple manufacturing partner. A stainless case before polished. iPod stainless case | Movies&Photos © Tokyo Broadcasting System Holdings. Hand polishing the stainless case with buff. The surface of stainless case is getting brilliant with his accurate polishing. A Brilliant stainless surface reflecting Kobayashi’s face. Mr. Kobayashi says, he does not have any jobs from Apple or other big manufactures today, but accept only small and laborious jobs so that he and his staffs can improve their polishing techniques everyday. This web site is owned by JEM INDUSTRIES CORP.